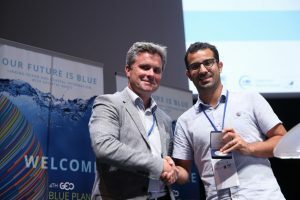 At the end of the GEO Blue Planet Symposium plenary on 4 July, Glenn Nolan, EuroGOOS Secretary General, awarded the 2018 Kostas Nittis Medal to Florent Gasparin. The Medal is awarded yearly by the EuroGOOS Executive Directors Board to a young scientist who has made a significant contribution to operational oceanography. “The EuroGOOS Kostas Nittis Medal honours Dr. Kostas Nittis, EuroGOOS Secretary General and strategic leader, and we hope it will help young talented researchers expand their scientific networks and horizons”, said Glenn Nolan. The Medal comes with a grant to attend and give presentations at relevant scientific conferences. Florent Gasparin, oceanography researcher at Mercator Ocean, specializes in in-situ observations with an outlook towards an integrated Global Ocean Observing System. He is involved in the EU AtlantOS project, in which he works on a physical Observing System Simulation Experiment (OSSE) conducted by European forecasting centers. This effort provides quantitative information of how further evolution of the in-situ networks would impact on global ocean monitoring and forecast. In 2016, the same medal was awarded to Mercator Ocean researcher, Angélique Melet (read more). In 2015, EuroGOOS established the Kostas Nittis Medal in the memory of EuroGOOS Secretary General and strategic leader Dr. Kostas Nittis (1964-2014). The Kostas Nittis Medal is accompanied by a grant and awarded to a young marine professional within the operational oceanography and broader ocean observing community. given a chance to present their research or technology at relevant events, building a professional network, gaining real life experience and reaching out to potential partners and/or employers.